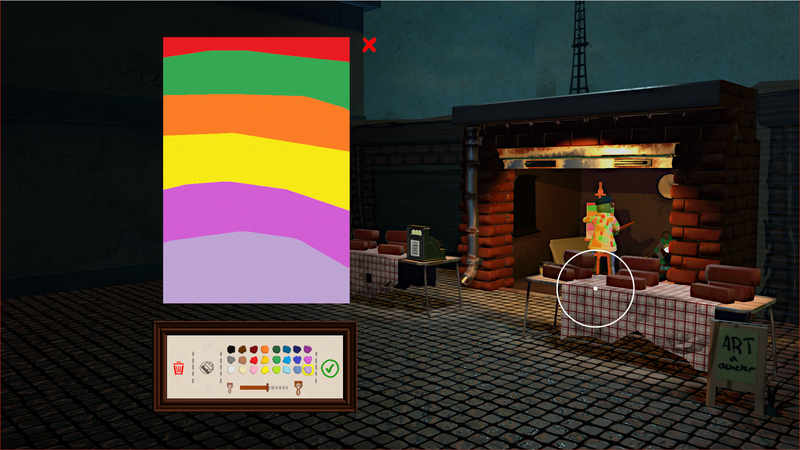 In this indie game, you play as a rejected Muppet named Passpartout that aspires to rise to the top of the art world through painting. You must sell your paintings for cash in order to pay your bills… otherwise, you’ll have to give up on your dream. You begin your journey in a cramped garage. In this game, you interact with only a few objects: your easel for painting, your vendor’s table where you sell your paintings, and your cash register which you can use to check your income and other game stats. As you go about your day, customers will walk by and appraise your art. Be warned, they’re more likely to tell you your art is garbage than to say they like your work. Steve, did I ask you for your opinion? Turns out, it’s difficult to make masterpieces when you’re working with a mouse. And so, customers will say that your work looks like a three-year-old drew it. Fed up, I plugged in my Bamboo tablet to create better, smoother designs. My customers reacted more pleasantly to my work, and paid me a lot more for it. You progress through the story based on the kind of art you create and who buys it. The more popular you become with a certain group determines the ending you will get. The game is broken down into three acts, and has seven different endings. When it comes to painting, you start off with only a paintbrush and 24 different colors. Using the slider, you can increase the size of the paintbrush or decrease it. As you progress to higher levels, you unlock more tools, such as the airbrush and steady pen, and you can upgrade the slider to make even smaller paint brushes. While I appreciated the painting options, I was frustrated at the lack of a fill or bucket tool. Without a fill or bucket tool, I found myself running out of ideas and energy to paint new pieces. Set out to become a visionary. Ended up a sellout. Starting off, I did surprisingly well. Some of my paintings were able to appease even the more difficult customers for that level. I was raking in the cash, but was unable to impress them for long. Wave after wave of insults rolled in: at one point in my playthrough, I just put up a blank canvas for sale, labelled, “Your Useless Brain.” That piece actually impressed the art critic and got me to the next level of the game. In the second act, I worked in a brick shop selling paintings to business developers and aristocratic ladies. My pieces appeased the business developers the most, and they were willing to shell out thousands of dollars for a few splotches of color and lines. In the third act, I decided to paint an epic masterpiece, which I spent 15 minutes on, in order to unlock an achievement. This is a huge risk, because the more time passes in game, the more money you lose. I lost thousands of dollars just making this piece. I added intricate details, and was profoundly pleased with my results. But my customers, the business developers, were not happy. They don’t like a lot of detail; they like simplistic paintings. They hated my beautiful painting with a passion, harping on about how it had “too many details.” They couldn’t understand my piece. I had to throw it out. When you start out in Passpartout, you can paint whatever you desire. But by the time you reach the final act of the game, you may find that you’ve pigeonholed yourself into painting specific things for your audience. I was able to recover and finish the game—I became the wealthiest artist ever known—but I was bummed out that my masterpiece didn’t sell. You can play Passpartout here.